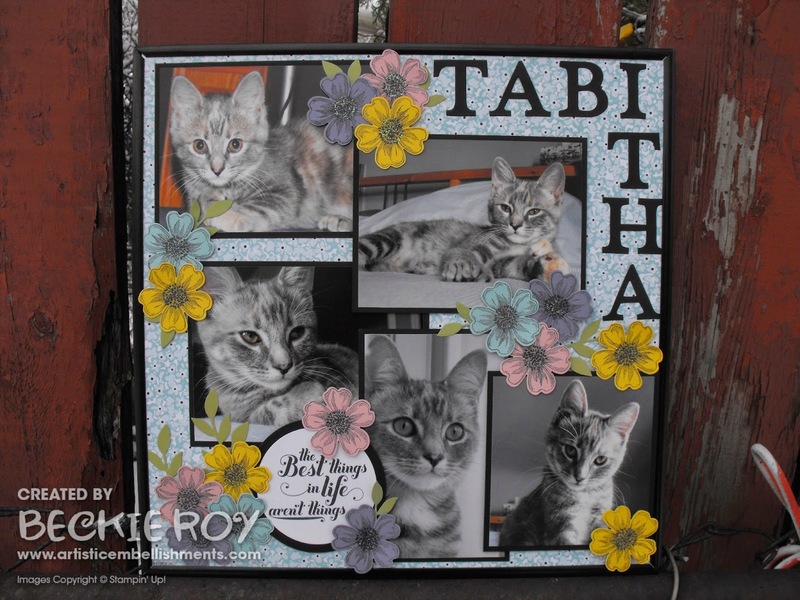 Artistic Embellishments: Tabitha, my beauty! 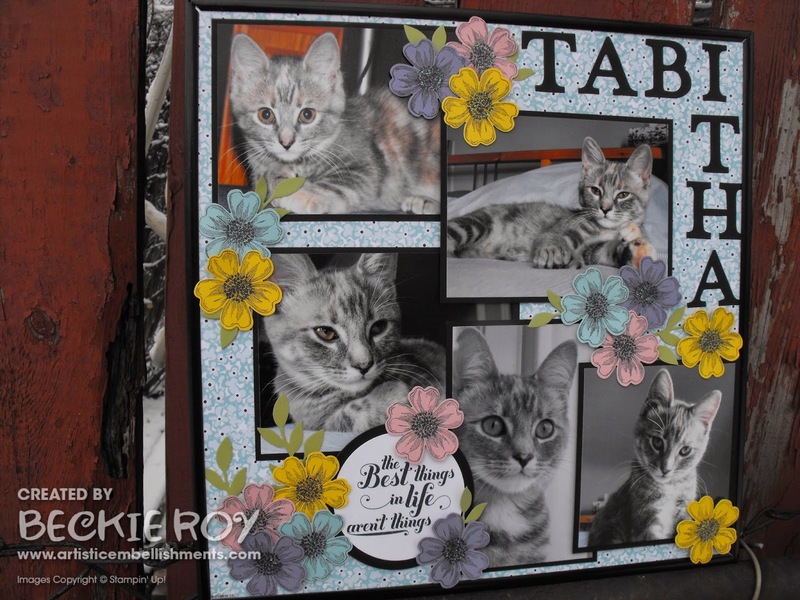 I have a scrapbook page to share today that I made with photos of my beautiful baby girl Tabitha. Almost two years ago I was working the Canada Day long weekend, I just finished up one of my programs and saw a cat. Naturally I went outside to see where the cat would go... she went behind the large storage shed behind my work. I walked to the back and noticed three tiny little kittens, two orange and one grey. That tiny little grey kitten was my little Tabbi! I decided right then that I needed to find out where this cat belonged. It turned out that she was abandoned after she became pregnant and she had her kittens under the shed. I just don't understand how people can do that to a beautiful animal. Momma cat was very friendly and over the course of the week I was able to catch all the kittens (three turned out to be five!) 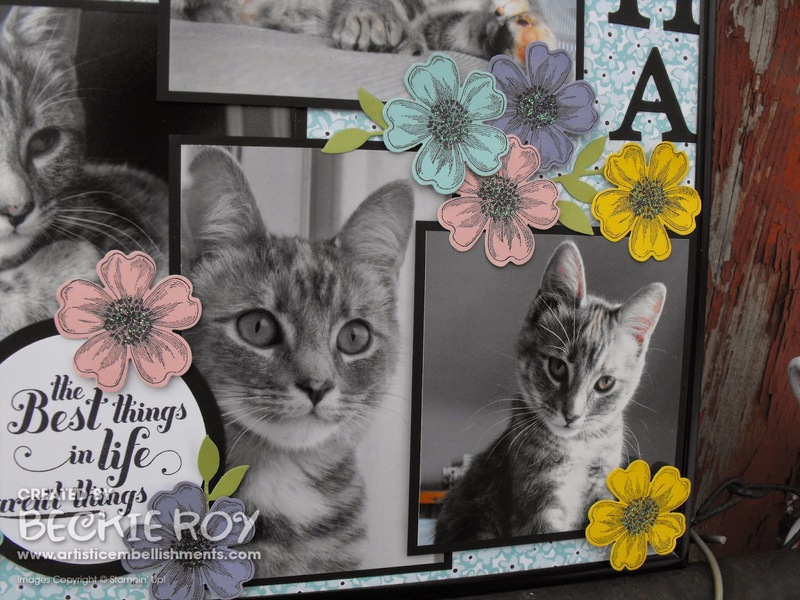 and the momma cat... and they lived happily ever after! Tabbi was actually the second kitten I caught, she was just a teeny little ball of fur - the first kitten I caught was Jeffrey (I kept him too!). I was able to find homes for the other three kittens and my mom took the momma cat in, she named her Alexis. The photo in the top left she was approximately 2 months, maybe less? She was only 2 lbs. To decorate my frame I used a piece of 'Sweet Sorbet Designer Series paper' from Sale-a-bration. I stamped and punched out some Pansies to decorate my page. I wanted it to be pretty and delicate like my beauty - the pansies really pop right off the page and make it appear more feminine! I added the sentiment from 'Feels Good', The best things in life aren't things... because it is very fitting as people and pets for me are the best things in my life!